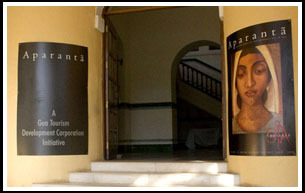 Tanya Abraham weighs up how Aparanta, a group show held in Goa, has been a true and fresh experience of difference. rt may be perceived and absorbed in multifarious ways. For me, being largely in Kerala and living amidst that which so clearly influences the existence of art in my state, an art show outside is nothing but a burst of fresh difference. Not that Kerala art is anything less than spectacular, but that which allows someone like me to immerse in a different flavour of colours and strokes. In Goa, at ‘Aparanta’, a show held at the GMC Complex, Panjim of 26 artists and their 268 works, I realised that every individual and artist is different, so intensely influenced by their surrounding, life and culture. Perhaps Goan art was never really talked about, never exposed enough. Maybe great artists like Francis Newton Souza or Angelo da Fonseca were born ahead of their times, blurring into oblivion. And so along with them the depth of Goan art. Thus, when a show such as ‘Aparanta’ decides to expose the truth of Goan art, of their talent and the language they speak, it is exciting, to a certain extent moving, to realise its existence. Produced at the Farmagudi (a place in Goa) Art Camp as well as others of the 19 artists who took part in it, these works traverse different medium and styles. But the beauty of the exhibition was that it did not confer to just another exhibition as a platform for various works, but instead it was a confluence of Goa’s art strength, beginning from the display of great works of Fonseca to Laxman Pai that then flowed to those of the newer artists of today. Artists ranged from not only those currently living in Goa, but even those whose lives were in some form influenced by its culture and life. For those like Pradeep Naik, a native of Goa, his style explores the beauty of vibrant colours expressed through acrylic. The obvious division he creates on his canvas clearly demarcates the subjects of portrayal in his art, like a fish or a rooster, or, a woman or a man. These always seem to have only a touch of realism, the remaining an expression of his imagination. Yet the idea is vividly conveyed, even decorated to the artist’s belief. Fine lines of paint in orange or red, or another colour of fancy is a very distinct mark of the artist, ‘a curtain of demarcation in many instances’. Shilpa Mayenkar Naik’s style is very different. Realism is her forte with a huge focus on domestic objects: Oversized bees or spiders occupy the space on her canvas close to trees, flowers or even storage bottles. Her work subtly relates to everyday life, largely those a woman may connect to. In her work titled ‘Garafao’ she provides a 3-D effect of the glass bottles in focus and the transparency of loose curtains, and large sized spiders that offer the feel of a dusty storeroom. Although the subjects are of everyday concern, it is the manner in which Shilpa has played with it that provides a unique style to her work, including the sari put out to dry, the intricacy of design and then, a grasshopper walking along the clothesline. Very different in thought and feeling is Siddarth Gosavi’s mixed media on paper. Through his art he talks about globalisation, its growth and the prison of man that is portrayed through animals. In ‘Ambiguity’ he depicts a figure almost roped onto a chair with the viciousness of a fierce animal and the soul of a placid ram. There seems to be an easy use of the mediums he works with, not loosing their essence in any form, instead exploring the juxtaposition of these to bring forth his concepts. Sonia Rodrigues Sabharwal gives a contemporary feel to the ‘Stations of the Cross’. Using Christ and the passion as her subjects in bright vivid colours of light and shadow she shows Christ’s sacredness, where his death and burial are of distinct character. And others like Yolanda De Souza Kammermeier with her personal creation of a ‘ceramic like affect’ of acrylic, gives a smooth, almost gluey, texture to her paintings. The exhibition also includes names like Dayanita Singh with her contemporary photographs that travel through the hearts and lives of Goa, especially of Goan women in natural and unintentional circumstances: a wedding, a home, a girl, a woman. And then there is Baiju Parthan with his Post-Hypnotical Journal-1 (archival ink on aluminium composite panel), a depiction of modern graphical exploration. I have mentioned only some of the artists, and done little perhaps to express the true grandeur of the exhibition. Yet it has been a true experience of difference, of Goa and of it texture, colour, design and more. Fresh and varied.